Thirteen of the 19 wards in Haringey are likely to be at risk from fuel poverty. One in four households in the UK are choosing between heating and eating this winter, as fuel bills hit record highs. But the government keeps cutting and the profits of the Big Six energy companies keep rising. Meanwhile, the government and Big Six want to generate more of our energy from dirty and expensive gas power, which will send fuel bills even higher and contribute to rising food prices through climate change. Join us in Haringey as part of a UK-wide weekend of fuel bill assemblies and action! 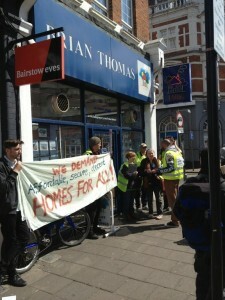 On Monday 18 March, North London Solidarity Federation picketed the Homes For Haringey offices in Wood Green and the depot for Groundwork, in Tottenham, who are employed by the Council to provide gardening and improvement services on estates in the area. The demonstration was against Groundwork's use of workfare; unemployed people are forced by Jobcentres to do the work. They are not being paid for it and they can't refuse or they would lose their benefits for two months. Last Wednesday, 27th March, Finsbury Park JobCentre Plus sent out a tweet to “congratulate” themselves on the news that 21 claimants were being put on a “work placement” scheme at Homebase in Harringay. On hearing the news, some members of Haringey Solidarity Group kicked into action to protest against this. Department for Work & Pensions, Jubilee House, Farthingale Walk, Stratford, E15 1AW. This Sunday, a few of people from Boycott Workfare will be coming to Haringey to picket Homebase in Green Lanes about their take up of forced labour. Sunday is their busiest trading day in the week. Please come along and join in. In just one week, Homebase in Haringey profits from 750 hours of unpaid work, with over 20 workfare placements in the store. A fact which they proudly display on a poster in their back office. Not surprisingly, this is having a massive impact on the paid work available: a staff member has told us that, since tens of workfare placements were brought in, overtime has been cut for everyone. Some people’s hours have been cut from 48 down to eight – far below the threshold for Working Tax Credits – because that is all they are contracted for. On Saturday 27th April 2013,as part of a London-wide day of action against Letting Agents, 20 Haringey Community Housing Inspectors went out to investigate the practices of local Letting Agents in Green Lanes, Haringey. Other actions took place in other parts of London including in Islington/Hackney, Brixton and Herne Hill, see the Let Down campaign blog. Haringey’s action was a follow-up inspection to one held six months ago – in October 2012, members of Haringey Housing Action Group became ‘Community Housing Inspectors’ and exposed the unwelcome practices these Letting Agents are engaged in: profiting and supporting landlords all to the detriment of the basic need of people to find an affordable, secure home. Join in, and meet at 12 noon outside Turnpike Lane tube. We will once again be taking to the streets of Haringey to inspect local letting agents as part of Let Down: a day of action against letting agents. Six months ago, on 6 October 2012, local housing campaigners became ‘Community Housing Inspectors’ to investigate local letting agents and uncover the unwelcome practices they are engaged in. On Saturday we are carrying out further inspections to find out if any of our demands for changes have occurred. Where they have not, we will be providing a ‘Cease and Desist Order’* to letting agents found to be engaging with greedy and anti-social behaviour. The ‘Cease and Desist Order’ will only be revoked if they put an end to such practices. Homes for Haringey is the borough's arms-length management organisation, set up to manage council housing. Recently, we have found out that local unemployed people are being forced to work on their estates for no pay and with no workplace rights. Haringey, Enfield, Bromley and Croydon have been chosen by the government to be used as a testing ground for their Overall Benefit Cap. People living with three or more dependent children will be most likely to be affected, facing cuts in housing benefit of up to £400 a week. But it will affect many others too. What can you do if you are affected, and what can we all do to resist this attack on our community? Ward's Corner: Help stop Grainger from covering up the lives and buildings they plan to demolish! Grainger have submitted an application to hang a gigantic advertising hoarding that will span the entire corner building of the Wards Department store. Below is a picture of what it will look like: you got to see it to believe it! Haringey health activists and doctors unite to prevent NHS privatisation! Protest at Haringey Landlords Forum - Tues 19 Feb, 5pm!